July has arrived and we’re setting off fireworks here at Yesware to celebrate all the new product updates coming your way this month, including Mail Merge with Templates for Gmail, Custom Date Ranges in Team Reports, and Templates for Outlook! No more setting up new Mail Merges each time. Now you can save Mail Merge templates, add new recipients, and pick up right where you left off! Team leaders can now easily view individual and team performance over a specified length of time. 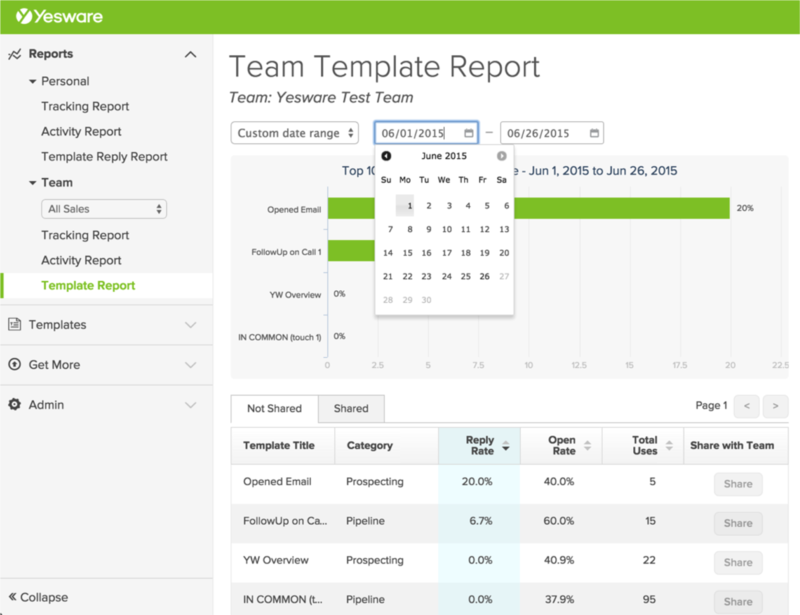 Just visit your Yesware Team Reports, click on the Team Tracking or Team Template Report, and use the new date picker control to select a custom date range for your report. Now introducing a new and improved template experience in Outlook. You can now create, edit, and manage all of your templates in real-time right from your Outlook inbox — no switching back and forth between different web pages. To get started using templates in Outlook, open the compose window and click on the “Templates” icon on the upper left-hand side of your Outlook ribbon, or click on the Yesware icon on your main Outlook screen, and select the templates option in the drop-down menu.